The 6-284 may well be the “ultimate” 6mm cartridge, if velocity AND accuracy are considered. While it burns a lot more powder than a 6BR, it also delivers a lot more velocity. John Southwick, owner of this week’s featured 6-284, can push 107 SMKs past 3400 fps–velocities no 6BR or Dasher can touch. He normally dials that back to 3200 fps or so, but that’s still well beyond the limit of even a 6 Dasher. John’s gun is more than a speed demon of course–it’s a hyper-accurate match rifle that has claimed many Varmint Silhouette wins. At his club, when John and the Black Borden come out to play, everyone else is usually competing for second place. John tells us “I started this project back in 2001, taking delivery in January of 2002. I chose the 6-284 mainly because it appeared in the winning equipment lists of 1K BR matches, and it was becoming very popular with long-range varminters. Skip Talbot had also recently used a 6-284 to set an IBS 1000-yard record (3.1”). Norma offered good quality 6.5-284 brass, so case-forming would be easy. I wanted a fairly light-recoiling rifle, and after much research I came to the conclusion that a high B.C. 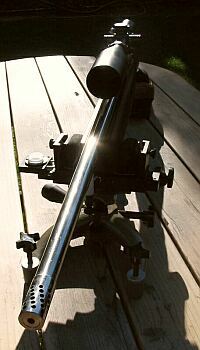 6mm bullet driven at 3200+ fps would meet my needs. I was looking for a “state-of-the-art” long-range target/bench rifle, primarily to use in 600-yard matches at my local club (Ojai Valley Gun Club), and possibly 1000-yard bench matches, plus occasional varmint hunting. I wanted to have a rifle that was built by a prominent gunsmith. 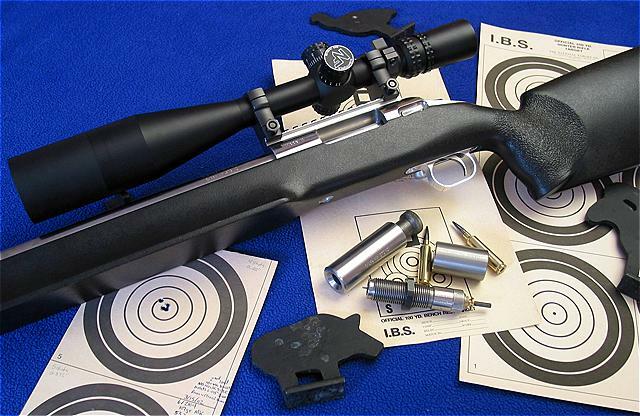 I chose to work with Jim Borden for several reasons: his rifles had set world records, his reputation was excellent, and his rifles often showed up in the winning equipment lists of IBS and NBRSA sanctioned shoots. Also I had decided that I wanted a Nesika-actioned gun. I was impressed that Jim had designed one of the Nesika’s key features–Borden Bumps. Likewise, I liked the Bald Eagle front rest, and found out that Jim contributed to their design as well. This gave me confidence that Jim understood every element that goes into precision rifle performance. My match load consists of Norma 6.5-284 brass, 51.0gr RL-22, Fed 210m primers, and Sierra moly 107gr MKs, seated about .010-.015″ into the lands. This runs about 3250 fps from the 28″ tube. Case necks are turned to .0133″ wall thickness for a .270″ loaded neck diameter. I use a .268 or .269 bushing, and bump the shoulders back each time. I set the “bump” so that, with firing pin removed, I can just feel the case in the chamber when closing the bolt. My loaded rounds typically show no more than .0015″ runout on a NECO concentricity gauge. I credit the low run-out in large part to the custom inline seating die and shoulder-bump neck-bushing die Jim made for me. Nesika ‘K’ Action, 1.70″ diam., Right Bolt, Left Port. 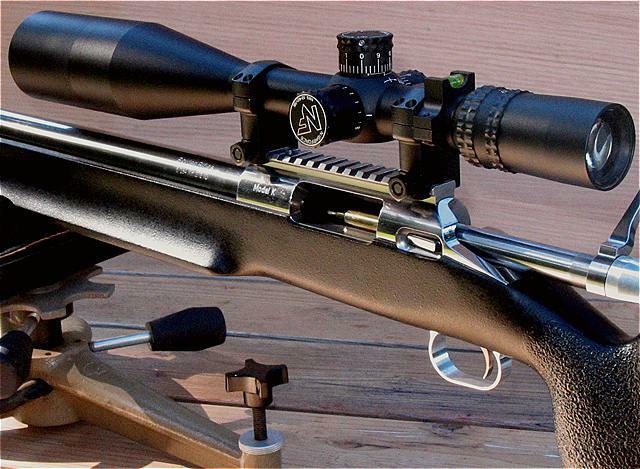 Hart 28″, 1:9″ twist, .920″ at muzzle, cryo’d with .272″ neck diam. and 1.5° throat. McMillan MBR stock, Borden texture finished, pillar-bedded, with action also glued in. NP-R2 reticle, 20 MOA ramped scope base, Leupold Mark IV rings. John’s rifle is a purpose-built gun, optimized for one task–hitting little half-size silhouettes at very long distances, at a shooting venue that demands serious wind wizardry. At Ojai, even though matches commence early in the morning, it’s not unusual to have a 10 mph wind blowing left to right at the firing line, no wind at the mid-course flag, and a swirling variable wind at the targets. To make matters worse, the little critters sit on top a ramped berm. When the wind switches to 6 o’clock, it can rise right in front of the target, sending shots high. Despite the often-wicked conditions, John and his Black Borden have excelled at the varmint matches–he’s the “smart-money” bet to win on any given weekend. 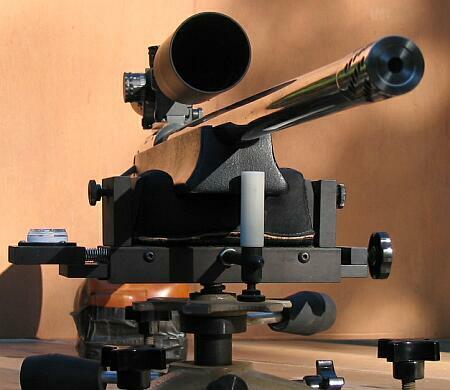 John reports: “The rifle has really proven itself at the 600-yard silhouette match at my local club. We shoot ten targets per match, usually three “matches” or relays per day. Targets are half-size NRA Hunter Pistol metallic silhouettes: 1 Ram, 2 Turkeys, 3 Pigs, and 4 Chickens (note, these are larger than the mini-silhouettes in the above photo). The Ram counts one point, Turkey two points, Pig three points and the Chicken counts four points. The Chickens have a “hit zone” roughly .6 MOA at 600 yards–about 3.6″. Trust me, that can be challenging, particularly in shifting winds. Unlike conventional silhouette matches, we shoot F-class fashion from the ground, using bipods or pedestal rests. That’s easier than shooting off your hind legs of course, but our targets are much smaller than standard high-power silhouettes. During the course of the season, John was running neck and neck with his friend and shooting partner Mike, who shoots a .243 Ackley custom. Unfortunately, John had to miss one match so he dropped down in the standings. Nevertheless, at the final match of the year, John managed to nail enough critters to edge out Mike in the overall standings. Once the results had been compiled he had secured the Club Varmint Silhouette Championship for 2004. That flat-shooting Borden 6-284 had done its job once again. We set up John’s 6-284 as we would for 1000-yard Light Gun competition. We’ve also built some of these rifles in 6MM BR for use in 600-yard competition. 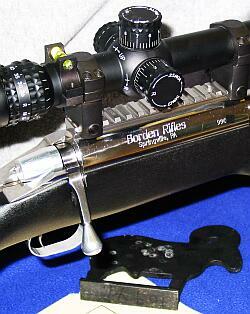 For John, we used a Borden/Nesika Model K 1.70″ diameter action as the beginning basis of the rifle. 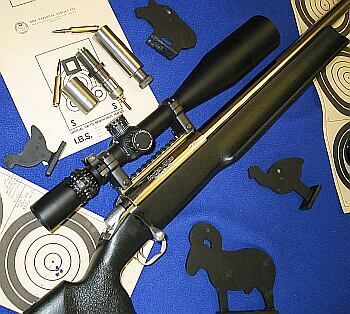 The timing and cocking-piece system for this rifle has the Borden improvements to improve firing pin energy and lock time. The action was pillar-bedded and glued into a McMillan Tooley MBR pattern stock. The stock blank was gel-coated and then epoxy-finished with a texture. We normally blend the brakes into the barrel to make the transition smooth and unseen. John preferred to have the brake larger than the barrel so that it could also be used on future barrels. The barrel is a Hart HV pattern 28 7/8 inches long and has a 1:9″ twist. Our 6×284 reamer has a .272″ neck diameter. It is throated with a tight cylindrical section followed by the 1 ½ degree throat. 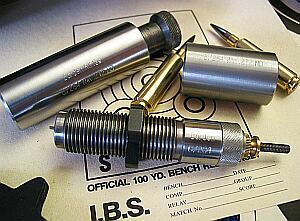 Chambering of the barrel was done utilizing our proven Benchrest chambering techniques. The method of chambering ensures that the body, neck and throat of the chamber align concentrically with the bore and grooves of the barrel. Our current rifles use our own Rimrock actions that were designed by Gary Amatrudo and myself and are built here in the Borden facility. We designed the Rimrock actions to optimize what we have learned about actions and shooting performance over the past 25 years. The opening and closing cams have been designed to operate together so that the operation of the bolt is smooth and “hitchless”. The fire-control system has been designed to minimize friction and to deliver maximum energy available to the primer while minimizing spring tension. Studio photos by John Southwick, exterior photos by Paul McM. All material Copyright © 2010, 6mmBR.com | AccurateShooter.com, All Rights Reserved. No reproduction of any content without advanced permission in writing. Baney's 6BR "Lil' Big Gun"